Hartsville First Church of the Nazarene schedule Hartsville First Church of the Nazarene, 1909 West Bobo Newsom Hwy. invites everyone to their services. Sunday School begins at 9:30 a.m. followed by worship at 10:30 a.m. and Sunday evening service begins at 6 p.m. Wednesday night Bible study begins at 7 p.m. Classes/ activities for all ages. For more information call Pastor John Porter and Pastor Karen Porter at 843-332-2521. Church of Christ schedule Church of Christ, 901 W Bobo Newsom Hwy., Hartsville, would like to invite everyone to join them in services: Sunday worship 11 a.m. and 6 p.m. Sunday school 10 a.m. Wednesday 6:30 p.m. Friday Bible study 7 p.m. (informal). They offer in home Bible study. For more information, please call the church at 843-332-6600. Lake Robinson Independent Baptist Church schedule Pastor Brian Enlow and Lake Robinson Independent Baptist Church invite everyone to join them in services. Sunday school at 10 a.m. and worship at 11a.m. Also, on Wednesdays at 7 p.m. Call 335-6595 for more info or check them out on the web at www.lakerobinsonbaptist.org. Church of God of Prophecy schedule Church of God of Prophecy church family and Pastor Jimmy Ray and Joan Jeffords would like to invite everyone to come and worship with them, feel the holy ghost spirit flowing. The church is located on Hwy. 15 in front of the IGA. Sunday school at 10 a.m. Preaching at 11 a.m. Sunday night at 6 p.m. Wednesday night service at 7 p.m. Got a heavy burden, come and be lifted up! For more information please call 662-8264, 307-5061 or 307-0225. Greater Heights Baptist Church schedule Greater Heights Baptist Church, 3304 West Bobo Newsom Hwy., invites all to attend their worship services each Sunday and Wednesday. Their Sunday school begins at 10 a.m. and preaching at 11 a.m. Evening services are held at 6 p.m. each Sunday night and 6:30 p.m. each Wednesday night. For more information, please call Rev. 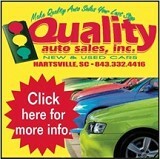 Danny Holley at 843-307-6957. Victory Healing Temple Church schedule Victory Healing Temple Church, 1109 South Fifth Street, invites you to join them in their weekly services, Wednesday Bible study at 7 p.m., Sunday morning School of Wisdom at 10 a.m., and worship service at 11 a.m. Pastor Apostle Harold Bennett welcomes you. For more information call Evangelist Agnes Holloway at 843-453-5413. True Saints Church of God in Christ schedule True Saints Church of God in Christ, 428 Poole Street, Elder William Rogers Sr, Pastor and Evangelist Dianne Rogers, First Lady invite everyone to come and worship with them during services. Sunday school at 10 a.m. Sunday morning worship at 11:30 a.m. Wednesday intercessory prayer at 6:30 p.m. Bible study at 7:30 p.m. Wednesday youth service at 7:30 p.m. For more information please call 843-383-8866 or email truesaintscogic@ att.net. Christian Fellowship Assembly schedule Christian Fellowship Assembly, 736 West Carolina Ave., invites everyone to attend services. Sunday morning worship at 10 a.m. and Wednesday night Bible study at 6:30 p.m. Victory Healing Temple schedule Victory Healing Temple House of Deliverance, Central Plaza next to Wal-Mart, invites you to fellowship with them. Bible study is held Wednesday at 7 p.m. each week. Joy night service is first, second and third Friday at 7 p.m. Sunday services 10:30 a.m. school of wisdom and regular morning service at 11 a.m. All their services are subject to change by the movement of the Holy Spirit. There is a true word of God and a blessing in store for you, so they encourage you to come and receive just what God has for you. For more information please call Evangelist Peterson at 639-2502. Consuming Fire Ministries Church schedule Pastor Apostle C. Adams and Consuming Fire Ministries Church family would like to invite you to attend services each week. Sunday school at 10 a.m., Morning worship at 11:30 a.m., Wednesday prayer from 6-7 p.m. Wednesday Bible class from 7-8:30 p.m. Everyone welcome. Church of Jesus Christ of Latter-Day Saints schedule The Church of Jesus Christ of Latter-Day Saints, 981 West Carolina Ave., invites all to come attend services each week at 10 a.m. For church tours, directions, literature and more information, please call 432-9153. Life in Abundance Outreach Ministries schedule Life in Abundance Outreach Ministries, 744 West Carolina Ave., church family and Pastor R. Phillips invite you to come fellowship with them on Sunday morning at 10 a.m. Worship at 11 a.m., Tuesday Bible study at 7 p.m. All other services will be announced. New Providence Baptist Church schedule New Providence Baptist Church invites everyone to attend services on Sunday morning beginning at 10 a.m. and evening service at 6 p.m. Awanas is on Sunday from 5-7 p.m. with Wednesday service at 7 p.m. Nursery is provided so bring the children and join them. Whispering Pines Independent Baptist Church schedule Whispering Pines Baptist Church, located at 2182 North Fifth Street invites you to come and enjoy the blessings of the Lord. Sunday school begins at 10 a.m., morning worship at 11 a.m., and evening worship at 6 p.m. Wednesday prayer service begins at 7 p.m. Everyone is welcome! 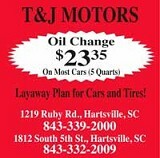 For more information call 843-332-4525. Rivers of Living Water Church schedule The Rivers of Living Water Church family welcomes you and your family to join them weekly as they worship and praise the Lord. Morning services are held each Sunday at 10 a.m., children’s church at 10:45 a.m., and evening service at 6 p.m. Bible study is held each Wednesday at 7 p.m. with open discussion and question/answer time. The church is located at 540 Pond Hollow Road. For more information call pastor Tom Gainey at 332-0291. Pine Ridge Church of God of Prophecy schedule The Pine Ridge Church of God of Prophecy, 9 Lawer ence Circle, McBee, invites you to visit them in their services where you will hear the word of God and meet friendly people. They have childrens church and lots more of God’s goodness. Sunday School 10 a.m., worship service 11 a.m., Sunday night service 6 p.m. and Wednesday night service 7 p.m. Pastor Rev. Marvin Jordan invites everyone to join them. Oates Baptist Church schedule You’re invited to come and worship with Oates Baptist Church, 3569 Oates Highway, Lamar, at any of the following service times: Sunday morning Sunday School at 10 a.m., Sunday morning worship at 11 a.m., Sunday night worship service at 6 p.m. and Wednesday night Bible study at 7 p.m. Everyone is welcome. Gerald McAlister is pastor. Praise Temple schedule Praise Temple would like to welcome you to their services on Sunday at 10 a.m. and worship at 11 a.m. Thursday night prayer meeting will begin at 7 p.m. Pastor Ricky Dutton and members welcome all. Faith Baptist Church schedule Faith Baptist Church, 2316 Faith Road, off Hwy. 151 towards Darlington, invites you to join them for Sunday School at 10 a.m., morning worship at 11 a.m. and Sunday night service at 6 p.m. Wednesday night at 7 p.m. The 1st Wednesday of each month they have “Family night” and start at 6 p.m. There will be food and fellowship and their WMU & Brotherhood meetings. They welcome anyone who would like to come join.